A group of wardens added to their improvements at Holywell. 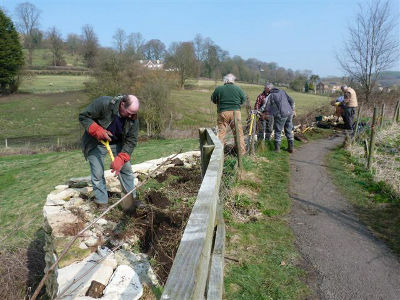 On Tuesday, March 8th a group of wardens added to their improvements at Holywell. They topped a dry stone wall and planted fruit trees & hedge whips for the Town Council. This is the site of what was the largest water-driven Mill in the District which we hope will be sympathetically developed into an example of industrial archaeology as well as a pleasant riverside recreational area. The Cotswold Way Footpath borders part of the boundary. The wardens are a group of volunteers, trained by staff of the Cotswolds AONB. They work primarily to encourage people to walk the Cotswolds and appreciate the area in which we live. This is achieved by warden-led walks, by individual wardens adopting a parish and patrolling its footpaths, and by work parties carrying out improvements as directed by the ROW officers at Shire Hall.